Some time ago I posted an article on the RAE web site by Robert Byers concerning his theory of post-flood marsupial migration. His theory was that of rapid speciation after the flood caused by favorable mutations. After pondering it a while and receiving a number of reviews concerning it, I was a bit unsettled with it and decided to remove it from the web site. Robert has it posted elsewhere at http://www.nwcreation.net/articles/marsupial_migration.html. I believe that there is a much simpler explanation and we need not appeal to rapid speciation. I believe that God created all of the genetic potential for all of the species on the earth in the beginning, and that these species were preserved on Noah’s Ark. Furthermore, I believe that the dispersion of all of these species globe-wide took place in the 500 years of Ice Age after the flood, when the ocean levels were 200 – 300 feet lower. Land bridges would have formed between Asia and Australia, and at the Bering Strait. According to several theories concerning Noah’s flood, the climate would have been temperate at the coastlines because of warm homogenized oceans stirred up during the flood. This would have facilitated migration of all of the species after the flood. My friend Dan Janzen traveled to Peru with Dr. Dennis Swift, Dr. Dennis Peterson and Dr. Don Patton recently to examine the Ica Stones found in a museum. 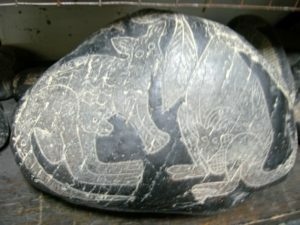 He noted the two stones in the following photographs that clearly depicted kangaroos. 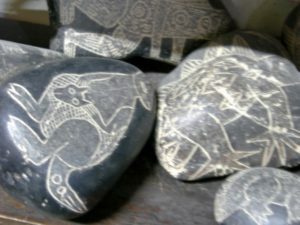 Now, you can dismiss these as fakes if you like, as many scientists (and even creationists) do, but discussion of the possible authenticity of these stones is quite interesting. Dr. Don Patton http://www.bible.ca/tracks/peru-tomb-art.htm is a believer in their authenticity as is Dr. Dennis Swift. According to Answers in Genesis, fossil marsupials have been found on every continent. (1) Presuming you can prove that one Ica stone is fake, it does not follow that all of the Ica stones are fake. Finding a counterfeit $20 bill doesn’t mean that all $20 bills are counterfeit. (2) Presuming you could prove that all Ica stones are bogus and that reports of marsupial fossils in other continents were incorrect, it does not necessarily follow that marsupials could not have dispersed from the flood to all continents, only to survive in Australia. So my conclusion is that marsupials migrated to every continent, but they died out due to conditions becoming more harsh and specific to the features of the creatures. The Kangaroo Ica Stones are circumstantial evidence that supports this. Places like Australia would have provided the environment as a haven for marsupials to thrive, whereas they would have died out in competition elsewhere. Evolutionists have as many problems explaining marsupials. They need to explain why the opossum is found in the Americas.